Grant Union High School will undergo a major transformation as an asphalt roadway is turned into part of the Pacer Promenade. 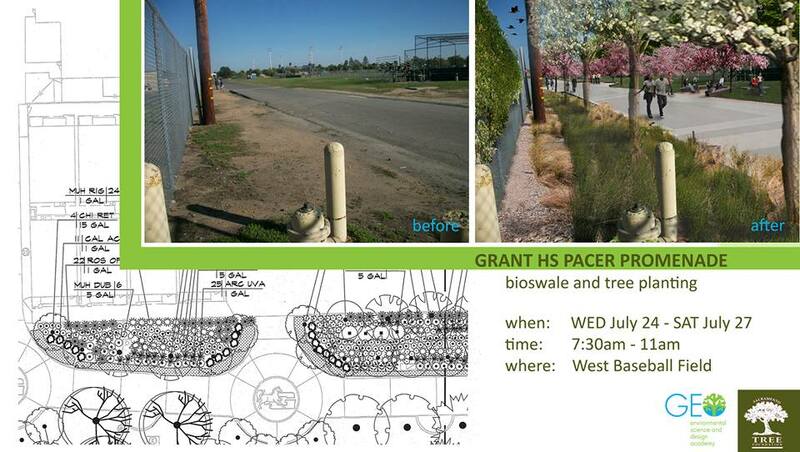 Beginning tomorrow and running until Sunday, Grant High School students, Twin Rivers trustees, community members, and various volunteers will plant thousands of trees and plants providing a safe and shaded walkway for students. 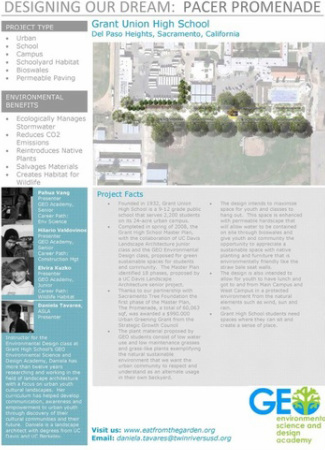 The Grant Union High School GEO Environmental Science and Design Academy’s students worked with UC Davis Landscape Architecture students to design a Master Plan for the school several years ago. 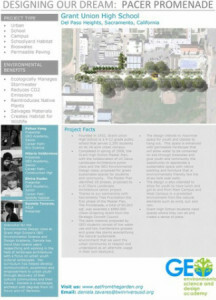 In 2012, the Sacramento Tree Foundation was awarded a $990,000 Strategic Growth Council Urban Greening Grant to implement the first phase of the Master Plan which focuses on transforming asphalt roadway into a safe and shaded walkway. The Promenade is 60,063 sq ft. The plant material proposed by GEO students consist of low water use and low maintenance grasses and grass-like plants. The design intends to maximize space for youth and classes to hang out, and is enhanced with permeable hardscape that will allow water to be contained on side through bioswales. The design is also intended to allow youth to have lunch and go to Main campus and West Campus in a protected environment from the natural elements such as wind, sun, and rain. Parking will be available in the lot west of the football stadium, located off South Avenue near Marysville Boulevard. July 25, 2013 in Del Paso Heights, GEO Environmental Science and Design Academy, Grant High School, Sacramento Tree Foundation.